I just wanted to post to thank the mysterious Secret Santa who sent me the above books for the Book Blogger Holiday Swap! 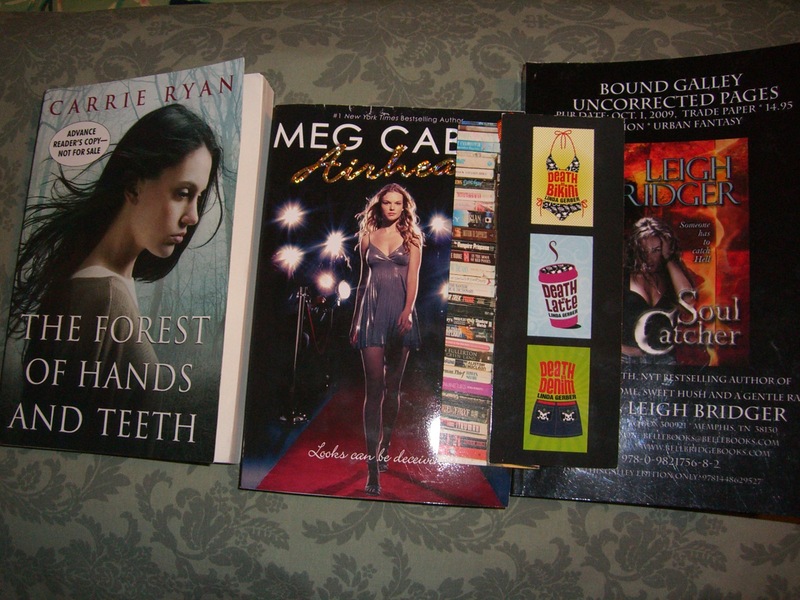 They sent an ARC of The Forest of Hands and Teeth by Carrie Ryan, Airhead by Meg Cabot, and a bound galley of Soul Catcher by Leigh Bridger. All I could see on the package was that this came from someone in Texas with the initial “M”. If you want to own up to sending me the package, I’d be really happy! These are awesome, I did not have any of these three books, and the two bookmarks are really nice (I love bookmarks). Thank you. This was quite fun. I found a cool YA blogger who I sent a gift to — GreenBeanTeenQueen. Is that a cute name for a YA blog or what?